Single family home planned to accommodate the owners through multiple life stages including full accessibility. Orientation of the house parallel to the west property line allows for the opening of living areas to choice views at the site’s southwest corner. A tall volume, capped with clerestory windows, serves as the plan’s primary organizer. 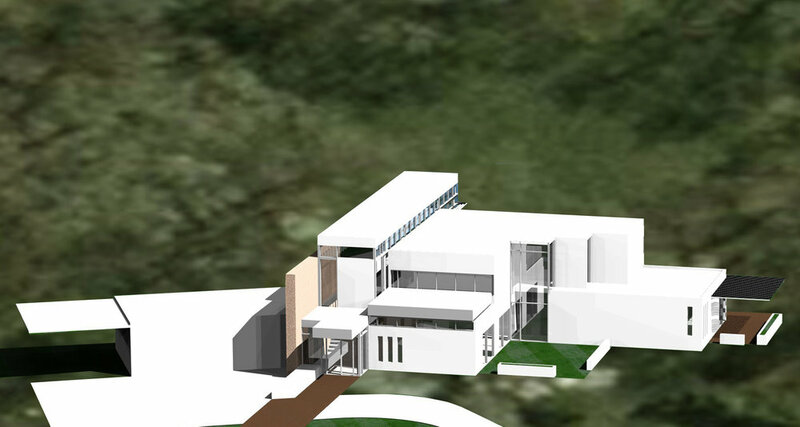 It is a vertical connector within the house, containing the formal stair and a three stop elevator, and a horizontal exterior connector, as it connects major site features: A reflecting pool at the front of the house and the swimming pool in the rear. An interior/exterior rusticated stone wall extending the length of the volume marks the main entrance as it screens the attached garage. A floor-to-ceiling glass wall at the base of the sunken patio admits natural light into the ballet studio in the basement.